This morning I woke up energized with my heart being full of appreciation from all the love and support I have been receiving towards my art all my life. The Essence of Being Exhibition began in Los Angeles and has now spread out to different parts of the world. World Art Dubai fair opened today April 12th and runs through April 15th, 2017 with my two works at Cross Borders Art gallery. My life journey continues ----- I am inspired by the ever changing flow of water --- the ocean, being fluid and embracing change. 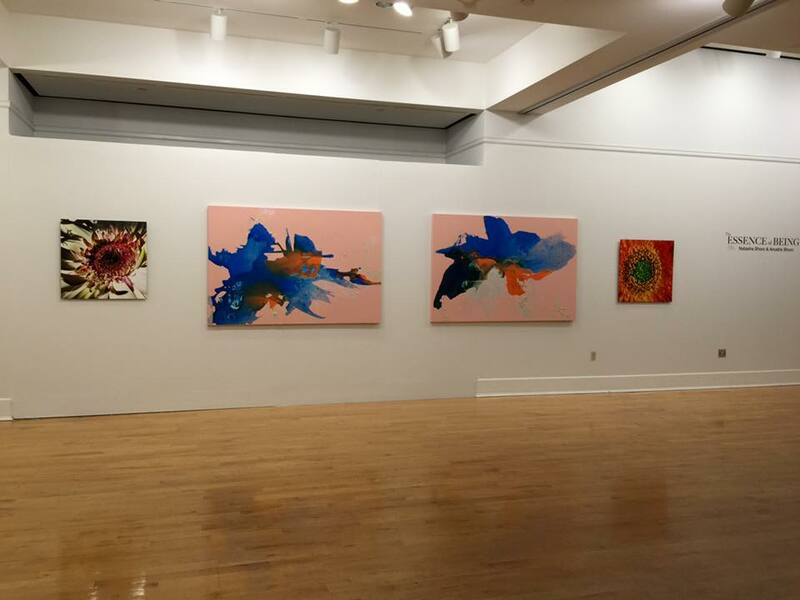 Our hearts are full with appreciation from all the love and support we have been receiving since our opening reception this past Thursday (February 4th) at Soka University of America's Founders Hall Art Gallery. As the bouquets of colorful flowers bloom in our home, we are reflecting upon how our journey of The Essence of Being has just begun. In all the preparation of getting our artwork wrapped, shipped and installed in the gallery, we seemed to have temporarily drifted away from the purpose of having this show, but were quickly reminded that now is the perfect time to be sharing our passion with the world. We were amazed at the turn out of over 150 people at our reception, including students, professors, colleagues, co-workers, artists, and friends and family from near and far. The feedback we received delighted us and the tears of so many filled up the room with warmth and moved us. This kind of affection and connection is really why we do what we do, and we hope to continue to inspire others through promoting what we are inspired by: the natural beauty and colors of the world. As many of you may already be aware of the timeline of this work, after four years of exploration and creation, we feel relieved with the outcome. As much as we are grateful to be living our dreams in sharing a part of ourselves with all of you, we realize that this is just the beginning of something even greater. We welcome questions about our work and our journey, and encourage those intrigued to attend our two upcoming gallery tour and discussion events, in March and April.